This proof is multi-page and multi-faceted. Hopefully, the possible indigestion caused by First Page, or perhaps the Second Page, will not prevent one from tackling this page. This page is more of the same, but different. The basic ideas are the same. The particular implementation of these ideas crops up with a few different twists. Hopefully, the mind expansion required does not convey head trauma. Both chains are equal in complexity, and perhaps equally easy/difficult to find. Note that there is considerably overlap in both almost chains when presented in this fashion. A == B -- C == D -- E. Thus it begs E == something. What is of interest to me here is that one can use the theory of appending simple bivalue/bilocation chains to predict the existence of many possible techniques. 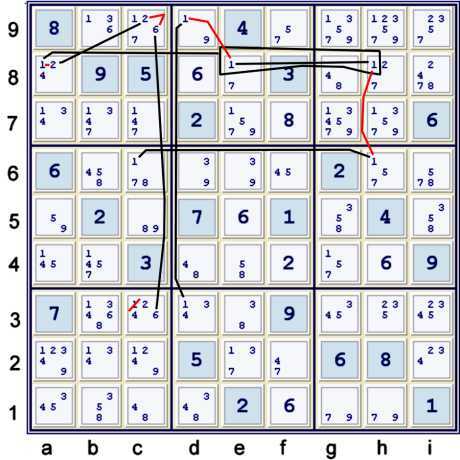 Considering those theoretical possible techniques, one needs only to keep in mind what they might look like in order to actually find them. Thus, in this case, one can note that an Almost Pair will be a marker for the appended chain above. 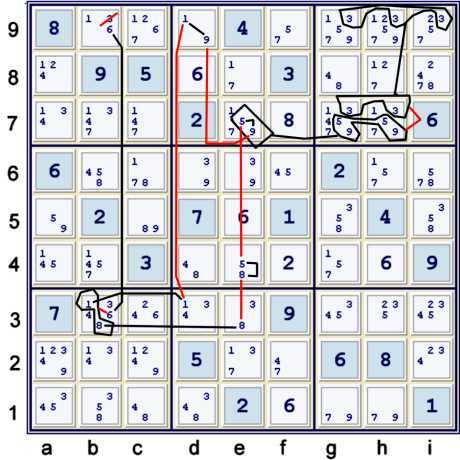 In a similar fashion, a marker for the elimination of 1 from c3 illustrated previously is an Almost Coloring Chain. Illustrated above is a very nice chain using two conflicting almostings, one of which must therefor exist. This building block for other AIC's is a common useful trick. Just like before, where I used this type of trick with the Almost Almost Hidden pair 58, I can use it here with Almost Hidden Pair 59. 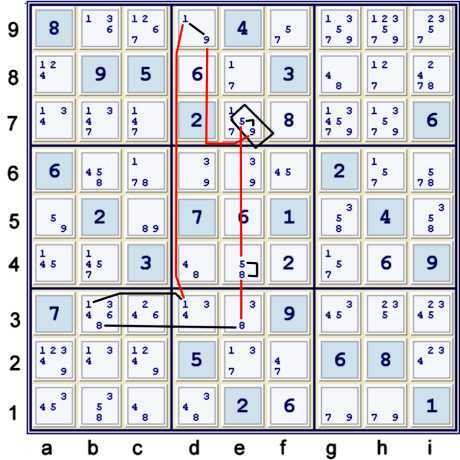 However, since both 5 & 9 outside of the Almost Hidden Pair exist in the same cell, e7, the deductions look a bit more typical. 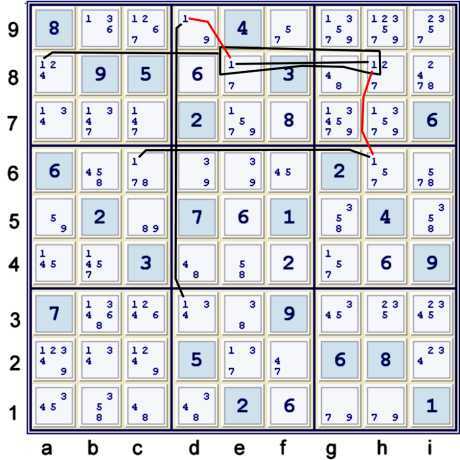 The typical puzzle mark-up heavily indicates that cell b3 should be involved in some chains. This is merely one of them that are possible that pass through that cell using the strong links with 168 that have an endpoint in that cell. Hopefully, this is clear! This concludes the third page of this proof. 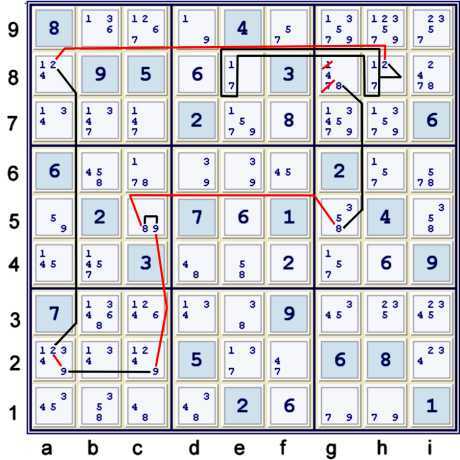 The possible technique discoveries that this puzzle wants to inspire are not yet complete. To continue to grapple with interesting but similar concepts, kindly visit the next page.